All things considered, would it be alright to say that the word “Sly” , is really the last name of Christopher from “The Taming of the Shrew” ? Some have charged that his tombstone appears as a keystone (a symbol used in Royal Arch Masonry), that there appears on the stone a crown and cross and that the stone is in the shape of a pyramid. Could the keystone be referring to the mini (small ) – tura stone? It does resembles the Auid wedge stone, somewhat. And I’m guessing that it isn’t actually up to scale, meaning that it’s a massive stone that is needed for the construction of a pyramid. The scroll that’s unfurling could represent a LOOP. But for the most PART, the shadow of the compass along the chisel could be the letter ” T “. The ruler starts with the letter ” R ” . The inverted compass turned right-side up is an ” A ” ( I think? ) . And the position of the hammer ( or mallet; maul ) I’m guessing, might very well be the letter ” P ” . So, all and all, it seems to be ( I’m probably wrong ) a TRAP of sorts. Oh, and I forgot to mention that the word ” TRAP ” can be seen to the left of the key block. That’s ok, Manson forgot to put it there. Kon-tiki just posted on the Trap page about the shadow falling on the chisel. Just wanted to agree that it DOES look weird but I think it’s OK — compare the bit of shadow you can see from the other arm of the compass falling on the map — it is parallel. That’s not to say the location of that point isn’t significant — it does seem to land at the middle of a spiral, and of course the stationary arm of a compass always lands at the centre of the circle it’s drawing, which could simply indicate that we are searching for the centre of the maze. Also, another thought I had. There’s a clear N, Y, and IS in the map that all have the same orientation and are all in that section to the left of the square. The “IS” is positioned beside the square. (LEFT) IS (RIGHT) — Left is indicated by the L of the square, and Right is indicated by the purpose of the square, which is to create right angles. We already know that left means right and right means left is a fairly consistent rule in Maze text. (Can’t remember if it’s totally trustworthy or not.) No is yes could just be a further warning not to trust the Guide when he speaks. The objects spell out “devil,” discuss amongst yourselves. Brandon believes that the letter “ S “ that is seen here, could actually be the overhead appearance of two individuals, that are shaking hands. Is this an attribute of every S? Does anyone else see hidden letters in the maze, such as: Z, U, C, Y, L, and an S? Here is my shot at a partial solution to the title page. I think the keystone is a signifier that the page is “key” — important. Instead of the objects signifying letters, what if they signify shapes? compass and mallet: circles (you use the compass to make a circle; the mallet has three circular ends. Squaring the circle is an ancient problem that has since been shown to be unsolvable. Now the expression “squaring the circle” has come to mean a hopeless or vain undertaking. I am not sure yet about the maze letters. I’m tempted just to pick out “sun” but then there’s that Y that is pretty clear… not sure. In terms of stuff in the book that connects, there are a lot of circles and squares. This is sort of exciting and sort of not — I mean, these are shapes that he probably would have been using regardless. But I’m just going to point out some ones where they seem to appear in meaningful conjunctions with one another, especially instances of circled squares or squared circles. Page 1: viewed from above, a drum, cup, bottle, and apple would all appear circular. The panels of the doors are squares. Page 2: in the left-hand fresco, the circular shields and the square sails of the boat. Page 4: full of circles and squares. Lots of circular items on the square table, especially. Page 15: more square and circular shadows? I didn’t say the Guide was Manson-take another look-I stated “I would deduce the Guide is “a Mason”… but hey, its only 3:00 am. But wait – how exactly would that follow – there is a Masonic/Mansonic tool kit and thus the guide is a Mason ? Why label the kit “CM” if is is about the guide? Room 39 is full of Masonic stuff and there are bits elsewhere – 8 for example. Considering what was already on the list, a real estate agent sounds downright sensible. Then I would deduce that the Guide is a Mason and that the items here are exactly what they look like. They’re just Masonic tools except for the MAZE blueprint-that would make them Manson’s tools. Manson’s Mason(ic) tools, huh? Nice. And the blueprint does have an “N” mixed in with other stuff, enough to make Mason into Manson. I don’t think Manson is the guide… But good thought. You know – the key ring does look a lot like a C and the teeth – if you put on your reading glasses and get out your magnifying glass – they are darn close to a capital M. I know and author with those initials. Yes, another “A” would seal the deal, and I don’t see it. 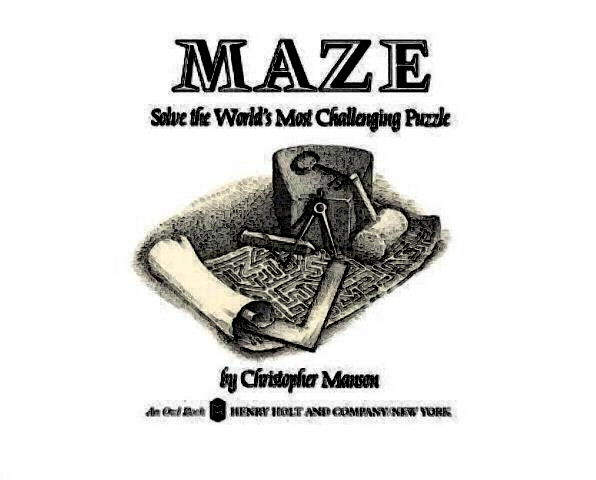 Of course, we can go outside the picture and take the huge “A” in “MAZE,” but that is not satisfying, as all the other letters on the page then come into play. Also, the stone is clearly in the shape of a keystone (the stone at the top of a curved arch). A key-shaped part of the stone is missing. A keystone minus the key is a stone, but I don’t know how to take it from there, if indeed we are supposed to go from there. Maybe just this – ATLAS is a KEY hint to EARTH, and SUN is a pretty good hint for EARTH too. SP – it has been noted that the letters A,L,T,S are on the cover page. But I just pointed out there is a 2nd A. It is upside down and uses the shadow of the compass. Also I was noting that there is an S, a U and and N in the map which can spell sun. I’m thinking that SUN and ATLAS are both reasonably good clues for EARTH if we are playing charades or something. ATLAS is even a KEY clue on page 26.
dave, true that, it wouldnt be unmansonesque to include a last slightly hidden clue. The objects depicted on the cover page can be used to spell “Atlas.” The spike crosses behind the compass to make an A, the mallet makes a T (as it also does in Room 4), the right angle is an L, we have to re-use the A from before, and there is an S in the map just above the angle. Is the key there to tell us that “Atlas” is the “key” to the maze? Well spotted! I assume you mean the S is a stake? No, you don’t need the spike to get “S.” if you look on the map of a maze that the objects are on top of, there is a free-standing (and therefore quite clear) “S” in that map. There is also a “Z” (or “N”), a “U” and a “Y.” I suppose you could get additional letters by taking parts of contiguous walls, but I find that less satisfying…. I would be more satisfied if there were two As. But all this makes me think you are on to something. You can get a second A using the left side of the compass, the shadow of it, and the spike. We’re done here. I am the atlas master. I think David Gentile is right: there is a second “A,” upside-down, created by the shadow of the compass and the spike. The Atlas comments here haven’t exactly gone in this direction, but for the sake of curiosity: if references to Atlas are part of a bookwide chain of clues suggesting Atlas is the guide, is there a way that his identity would comport with the more literal clues of the guide’s identity? I specifically wonder about deceptions being practiced on his father, a clue that I don’t know how to apply offhand to Atlas. I don’t know the significance. I doubt that Atlas is the guide since he is part of the riddle. But if there are two text references (along with two or three visuals), then what about hidden words in 44? Is he just playing with words or should it mean something? PS I saw the Atlas title page on an old website, although it is a C not an S in my book. Did anyone list the other Atlas pictured? (I know it is very simply found) besides the A and SALT. I don’t know whether the appearance of the letters “at las” in the phrase “at last” constitute a textual reference to Atlas or not; they don’t seem to occur in contexts that have any meaningful connection to atlases of either the cartographic or mythological kind. “Atlas” is perhaps absurdly overclued in Room 26, which raises some eyebrows in regard to whether it is just part of the riddle of the path. What are you taking for back pain? Sorry, I wasn’t trying to play your game of hinting without telling, it’s just that I thought pointing out the actual location of all the letters to be irrelevant (because I don’t think they all come together to mean something), inexhaustive, and not too cryptic. N, Z: In the walls of the maze blueprint, near the chisel. Could be either N or Z depending on how you look at it. Y: Between the tip of the compass and right end of the L square. L: The L square; there are a couple L shapes in the walls of the maze blueprint. A: Apparently, the compass, and the shadow of the compass on the chisel. T: The mallet. Again, I GUESS. I know the gavel in 4 has pretty widely accepted as a T, but this is even less traditionally T-shaped than that. O, C, F: I’m just looking at the parts of the key impression on the key stone. Without much imagination, it’s an F connected to an O. However, the conjunction of the F and the O is actually notably lightened compared to the darkened imprint of the rest of the key impression, suggesting perhaps that they’re not joined, or, if that section is not to be treated as part of the O, that what we’re left with is a C.
I don’t mean any of that to suggest that those letters mean anything, that I think they are supposed to be there; I was only off-handedly noting that there are a lot of letters there to play with. The heavy presence of Atlas in 26, the missing Atlas in 32, (the present one, for that matter), some of the clues to the guide’s identity (e.g. Room 6′s mention of the weight over their heads being oppressive “even” to the guide, suggesting that he is accustomed to bearing great weight), the fact that an atlas is a guide to the world (in a manner of speaking); there’s a lot going for the deliberate inclusion of Atlas here. And even though I’m not terribly sold on the title page suggesting Atlas, it’s not entirely fanciful. “At las” appears in the text three times, and while it’s not in a context that suggests anything meaningful, well, it’s there. But if all of this isn’t heading toward Atlas being the guide, then I don’t know what the point is of all this atlassing. And that’s why I asked about reconciling Atlas with the literal clues about the guide. When I brought up the possibility of “Atlas” on the title page, I wasn’t thinking about the identity of the guide at all (I am doubtful that Atlas is a good fit for that role). Assuming that there is indeed an “Atlas” here on the title page, I take it and the “at last”s elsewhere as simply reinforcing what we are supposed to find in Room 26 – the word that is arguably the key word in the riddle of the path. In the Maze blue print there is N/Z and U/C and with the S, that is where I was seeing “SUN”. OK – bringing the title page discussion to the correct page. I agree we have a “Y” in the maze. The N/Z could be used either one way but should we would guess only be used one way. The spike – I don’t think you can count any line as an I – it should have 3 lines. Granted there is a candle stick and a mallet in 4 spelling “IT” – but there we know the “I” by context. The “T” from the mallet – is sort of a re-use from 4. Then there are the potential letters in the key. If we suppose he did not mean us to use the key – and just meant a key – then we have “ATLAS” , “SUN” and “Y” from the rest of the stuff. If the key is included then – O F Y or C F Y are left over. Which does not seem to be anything. And since the key letters are an easily identifiable set, it is not really problematic to exclude them and make words from the letters outside that set – but, yes, that “Y” is a bit of an issue then. It’s still very likely from a probability point of view that he meant to suggest 2 fake guide candidates here. But it would certainly be better if we had a non-random explanation for the “Y”. It’s not likely he missed it. Nor is it super-likely he threw in one random letter to mess with us. Rather – it probably means something. I wonder if it might be fair to add one line to make it a claw, Hmm. Or….if Vince was right about the spike being an I, and we are supposed to get an I and a T there, just like the I and T in room 4 – then we have ATLAS, SUN, and Y an I – which work together like the two banners in room 2. There are letters in the maze. Has this been mentioned before? oops i see that it has been mentioned before, sorry. There are letters in the maze on the paper. The hammer and spike is like the hammer and candle from room 4. In room 4 it is the word “IT.” Does that mean we have the letter I and T here?